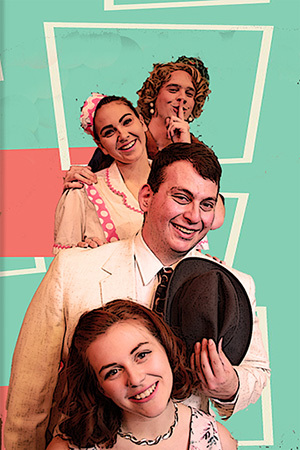 Lewis University’s Philip Lynch Theatre (PLT) continues “chasing the dream” this season with the hilarious farce "Leading Ladies" by Ken Ludwig. "Leading Ladies" will be performed on November 9-11 and November 15-18 and is recommended for patrons 13 years of age and up. Evening performances are 8 p.m. and the Sunday matinees are 2:30 p.m. In addition, there is a matinee performance at 4 p.m. on November 17. Advanced ticket purchases are strongly encouraged. Ticket prices are $10 for an adult, $9 for students and seniors. Lewis University students pay $2 with an ID. Group tickets are available for parties of 15 or more. Running time of the show is approximately 2 hours and 20 minutes with an intermission. Tickets are non-refundable. In "Leading Ladies," two English Shakespearean actors, Jack (Simon Merheb of Bartlet) and Leo (Andy Wainscott of Mokena), find themselves so down on their luck that they are performing “Scenes from Shakespeare” in the Moose Lodge circuit in the Amish country of Pennsylvania. When they hear that a wealthy elderly lady, Florence (Olivia Ferrari of Peru) is about to die and leave her fortune to her two long lost English nieces, Leo and Jack, resolve to pass themselves off as her beloved relatives and get the fortune. Romantic entanglements ensue, especially when Leo falls head-over-petticoat in love with Meg (Emily Buchanan of Chatham, IL), Florence’s vivacious niece, who’s engaged to the local minister, Duncan (Jacob Coats of Lombard). Meg knows that there’s a wide world out there, but it’s not until she meets “Maxine and Stephanie” that she finally gets a taste of it. Other members of the cast include Audrey (Christy Carlson of Lockport), Butch (Santos Rivera of Alsip), and Doc (Conrad Sipiora of Chicago). The comedy is directed by Theatre Department Professor, Kevin Trudeau of Chicago Heights. Associate Theatre professor and designer, Andrew Nelsen of Joliet provides the lighting and scenery for a handsome 1958 living room. Resident costumer Celeste Mackey of Crest Hill, is providing her talents with wardrobe, hairstyles and makeup. Working behind the scenes are Natalia Bednarczyk of Burbank (stage manager), Katie Horn of Sturgis MI (assistant stage manager), Bradford Bingham of Chicago (properties manager), Julia Egizio of Plainfield (properties assistant), Brianna Knutsen of Plainfield (light board operator), Haley Marchewka of Loves Park IL (sound designer and operator), and Dave Pomatto of Naperville (assistant technical director). The front-of-house staff is Hannah Krause of Mazon (box office assistant), Jamie Voustros of Chicago (box office assistant), Estefania Flores and Alicia Iuliuno both of Tinley Park (house managers). Ludwig is a Tony Award and a two-time Olivier Award-winning playwright. His Broadway debut was his Tony Award-winning play "Lend Me A Tenor." Ludwig has been hailed as “America’s preeminent comic playwright” and the PLT has produced three of his comedies: Moon Over Buffalo (2003), Shakespeare in Hollywood (2011), and The Beaux Stratagem (2013). He has written 25 plays and musicals, with six Broadway productions and seven in London’s West End. His work is so well-known that it has been performed throughout the world in more than 30 countries and in over 20 languages. For more information, patrons can follow PLT on social media @pltlewisu, call the box office (815) 836-5500 Monday through Friday 1-4:30 p.m., or check out the PLT Website at www.lewisu.edu/plt. The theatre is located on the main campus in the Oremus Fine Arts Center on Route 53, Romeoville.